Legacy is a BBC TV film based on Alan Judd’s novel of the same name which is set in 1970’s London during the height of the Cold War where a trainee MI6 spy is tasked to seek out a former friend, now a Russian diplomat with the hope of “turning” him. As both men have their own agendas, a dangerous game of cat and mouse begins around a secret plan for a lethal attack within the UK. 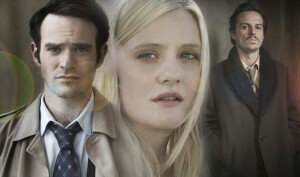 The film is part of BBC Two’s Cold War Season and stars many familiar faces including Andrew Scott (Sherlock, Saving Private Ryan), Romola Garai (The Last Days on Mars, Amazing Grace), Charlie Cox (Boardwalk Empire, Stardust), Geraldine James (Sherlock Holmes, Alice in Wonderland) and Olivia Grant (Mr.Nice, Lark Rise to Candleford). The screenplay is adapted by award-winning writer Paula Milne (The Politician’s Husband, Endgame) and directed by BAFTA-winning Pete Travis (Dredd, Omagh) and is the second time the pair has collaborated since the 2009 film Endgame. The Legacy production team visited Deal in July 2013 where they filmed the two main characters meeting at the pier as well as scenes on the seafront where a car pulls up and a man gets out and make a call from a public phone box. Deal is a town in East Kent situated between Dover and Ramsgate and has a wealth of independent shops, eateries and delightful seafront with a pier and maritime clock. Previous productions that have taken advantage of the area including The Tunnel (2013), Little Dorrit (2008) and Ruby Blue (2008). Don’t miss Legacy will be shown on BBC Two at 21:00 on Thursday 28th November 2013. This entry was posted in Filmed in Kent and tagged Andrew Scott, Charlie Cox, Deal, Geraldine James, Legacy film locations, Olivia Grant, Romola Garai, TV Drama. Bookmark the permalink.